Native to China and Vietnam, star anise is grown today almost exclusively in southern China, Indo-China, and Japan. Star anise, (aka Chinese star anise) is the seed pod of the star shaped fruit of a small oriental tree. Star anise is not related to the European anise plants although it has a similar anise or licorice-like flavor. Its licorice-like flavor actually bears a close resemblance to that of fennel and basil – tomatoes classic companions. A single pod of star anise adds a new level of flavor to a tomato-based sauce or stew with a warm, spicy undertone. Star anise can be the secret ingredient that elevates a dish to a whole new level. Star anise is an ingredient of the mixture known as “Chinese Five Spice”. 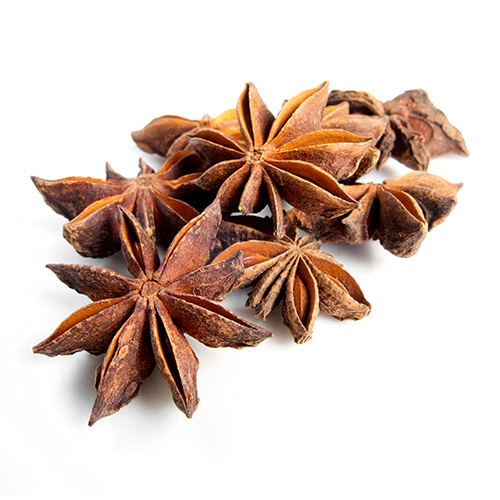 Star anise is used in Chinese red cooking, where the ingredients are simmered for a lengthy period in dark soy sauce, and is nearly always added to beef and chicken dishes. Chinese stocks and soups very often contain the star anise spice. In the West, star anise is added in fruit compotes and jams. Star anise is also regularly used as an ingredient in sweet dishes like puddings and pastries. Apart from its use in sweetmeats and confectionery, where sweeteners must be added, it contributes to meat and poultry dishes, combining especially well with duck. Be adventurous and experiment if you enjoy this particular flavor. Star anise plants are fast growing evergreen trees. Sowing of the seeds is in the spring and are harvested just before ripening between March and May.